When 2012-13 O-Pee-Chee Hockey arrived, collectors were quick to find a surprise insert that wasn't advertised in advance and didn't appear on Upper Deck's final checklist. 2012-13 O-Pee-Chee Hockey Black and White is a 36-card set that highlights many of today's most popular players as well as a handful of retired greats. The set is a throwback to the Deckle Edge cards from 1970-71 O-Pee-Chee Hockey and Topps Hockey. Similarly styled vintage Deckle Edge cards can also be found in 1969 Topps Baseball and 1974 Topps Baseball. While there are some subtle differences, the design is certainly inspired by these classic inserts. The most distinct features on the cards are die-cut edges. They are like those found on a stamp. 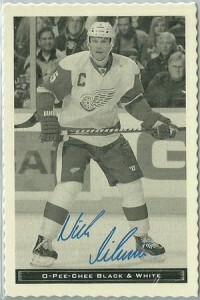 Card fronts have a black and white photo and a blue facsimile autograph. 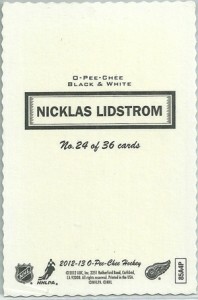 A strip across the bottom of the card states the insert's name. Similar to the original Deckle Edge cards, 2012-13 O-Pee-Chee Hockey Black and White card backs have minimal info, mainly the player's name and the card number. They have been very hot on the secondary market so far as well. A Bobby Orr went on eBay for $299, although the dealer did phrase the description and title to make it sound like the facsimile autograph was real. Joe Sakic, Patrick Roy and Brett Hull have also had early sales over $100. In early eBay auctions, most of the 2012-13 O-Pee-Chee Hockey Black and White cards have been selling anywhere from $50 to $100. UPDATE: Upper Deck has now confirmed that 2012-13 O-Pee-Chee Black and White cards fall 1:960 hobby packs and 1:1,920 retail packs. Below you will find a 2012-13 O-Pee-Chee Hockey Black and White checklist with confirmed players, teams and numbers. 2012-13 O-Pee-Chee Black and White #18 John Tavares Islanders RARE! My son just pulled a black and White RNH, what a good surprise! So awesome to see OPC card again, I remember my dad came back at home each time with a hockey pack. Sweet!